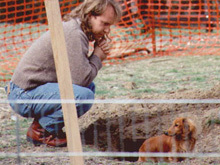 Brandy, Remy and Ouzo participate in Earthdog Tests, AKC-sponsored events which test a dachshund's instincts for hunting underground. The tests are run under simulated hunting conditions, using a man-made underground lair with caged rats as the quarry. 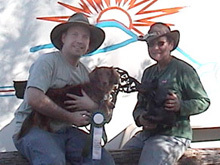 Remy achieved his Junior Earthdog title in October 1999, his Senior Earthdog title in November 2000, and his Master earthdog title in January 2003. Remy thinks that "hunting" rats is the most exciting thing in the world. 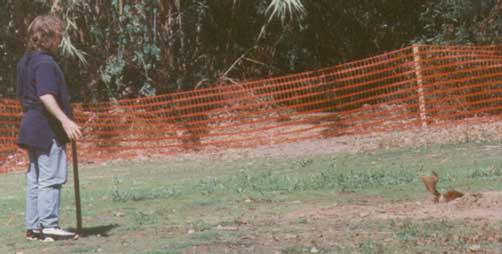 Brandy ran in her first Introduction to Quarry test in 1998, but didn't really "get it" until she was four years old. Now she is a regular demon of the dens -- with a Junior Earthdog title in January 2002 and her Senior Earthdog title in October 2003. Ouzo was a fast starter, earning his Junior Earthdog title in January 2004, just six months after joining us, and his Senior Earthdog title in June 2004. Above, John is coaxing Brandy into the tunnel. The tunnel consists of two 5' legs. At the end (where the judge is waiting) is a caged rat. Read below to see how Brandy, Remy, and Ouzo have progressed through the different earthdog tests (in reverse chronological order). You'll see that patience is the key -- a dog may seem totally uninterested one day (or month...), and then pass with flying colors the next. June 2004: Ouzo earns his Senior Earthdog title, Brandy gets two Master legs, and Remy is a double Irondog! We had our best two days of earthdog ever at the Great Western Terrier Association earthdog tests on 21-22 June in Anaheim. On Monday Ouzo earned his third SE leg and Senior Earthdog title. He almost went racing overland to the quarry, but his head jerked around at the last moment and he picked up the scent line. We'd worked on recall and he came out in about 30 seconds. Our next goal was for Brandy to qualify in Master Earthdog. Her problem has been racing straight to the den and failing the hunt. John worked hard to keep her interest during the hunt and she passed on both days, earning her first and second ME legs. Given Brandy's tortured earthdog career, we're amazed and proud at what she's been able to accomplish! Finally, this was the first local test under the new rules in which Master Earthdogs are able to compete in both Master and Senior on the same day. GWTA was offering the "Irondog" medallion for dogs that qualified in both. Remy was one of several dogs that qualified in both ME and SE on Saturday and the only one to qualify in both on Sunday. One judge described him as a "border terrier disguised as a longhaired dachshund." Ouzo almost qualified in his first ME run on Sunday, but was frustrated by the roller obstacle and took a bit too long to get to the quarry. Our only non-qualifying run of the weekend. GWTA was giving out very nice coffee mugs for qualifying dogs -- by the end of the weekend we could have opened a coffee shop! Brandy, Remy and Ouzo were all entered in Senior Earthdog at the Dachshund Club of America earthdog test in Anaheim during DCA week. We needed them all to pass as part of the DCA Triathlon, so we entered Brandy and Remy in Senior rather than Master. We were very proud that all three passed. The recall is of course the potentially tricky part of the SE test. Brandy and Remy recalled in under 10 seconds -- no problem there. Ouzo took almost the entire 90 seconds, but he finally came flying out when I started yelling about Remy getting the rats! This was Ouzo's second SE leg. On the previous day, Ouzo failed the SE test when he failed to pick up the scent line and couldn't find the entrance in time. Ouzo passed the Junior Earthdog test again and earned his JE title. He reached the quarry in 18 seconds and was working almost immediately. Working the rats has become a passion for this little guy. On Sunday he made his first attempt at Senior, and passed. As you'll notice from the ordeals recounted below, Brandy and Remy took considerably longer to get their first pass. At the same trial (the DCSAV trial), Brandy made a good showing in Master Earthdog both days. She didn't indicate the entrance on Saturday - the rats weren't at the entrance - and raced straight to the den on Sunday, failing the hunt. Remy showed those dogs in Senior how it should be done on Saturday, and had a good showing on Sunday in Master. October 2003: Brandy gets her SE title and Ouzo gets his first JE leg! After failing the SE test fourteen times (by either going in the wrong entrance or working in the false den) Brandy finally figures out the SE test at a practice session held at the Canyon RV Park in Anaheim. The next weekend (October 4-5) she passes the SE test on both days, going in the correct entrance with out delay, reaching the quarry in plenty of time, working vigorously and recalling in under 10 seconds. On October 18, Auntie Bertha takes her to the Welsh Terrier test in South El Monte. She fails to reach the quarry on time but is allowed a retest. On the second attempt her performance is excellent and she receives her third leg and Senior Earthdog title! Three years ago who would have believed that Brandy would ever be a Senior Earthdog? Ouzo is showing great promise as an earthdog. He started working the quarry in our very first practice session and passed the Introduction to Quarry test in June four days after we brought him home. At the practice session at Canyon RV Park in late September he learns to run the 30 ft JE tunnel. On 4 October he takes a bit too long to get to the quarry but does a great job working. On 5 October he passes the JE test and earns his first leg. Bertha runs him in JE on October 18 -- he's somewhat uncertain in a different location and comes out of the tunnel and wanders around before being redirected into the tunnel. He needs a little encouragement to start working and then works vigorously. 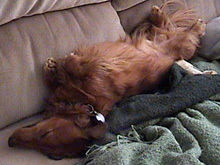 1-19-2003 (DCSAV, Anaheim): Remy gets his Master Earthdog title! After 10 unsuccessful master tests, Remy put all the pieces together on 18 and 19 January for his third and fourth master earthdog legs. His hunts to the den were great, entrance indications were good, he reached the quarry in under 30 seconds, dug, barked and lunged for the required 90 seconds, and did a beautiful job of honoring. Remy receives his fourth leg ribbon from judge Charlotte Levecque. Remy and John celebrate with judge Carol Hamilton, who awarded Remy his third leg. Margaret Hummen goofs around with Carol, John and Remy. Brandy put on a excellent performance in Junior Earthdog on Saturday and earned her fourth JE leg. But she fails again in Senior on Sunday by heading for the wrong entrance and working in the false den. 2002: Not a good year. Remy had both good and bad performances in master earthdog, but never put all the pieces together. His hunting and honoring are always solid, but sometimes his indication is weak (he wants more feedback from John) and he doesn't always work for the full 90 seconds. We had Bertha Adamson run Remy in Senior and Brandy in Junior at the December earthdog tests, since we were out of town. They both qualified at this level! 1-20-2002 (DCSAV, Crossroads): Brandy gets her Junior Earthdog title! Brandy passes her Junior Earthdog test on Saturday -- 29 seconds to the quarry, starts working instantly, and works for the full 60 seconds. She's a Junior Earthdog! On Sunday, Brandy enters her first Senior test. She entertains the crowd by first working the JUDGE for the full 90 seconds. Once John directs her to the tunnel entrance, she gets to the quarry in about 30 seconds, works for 45 seconds, pauses and then works the remaining time. She recalls in 26 seconds! Remy almost gets his third masters leg on Sunday. He does everything perfectly, but has a 7 second break in his working (you're only allowed about 5 seconds). Still, he was rewarded by being selected to run with the bye-dog in the last brace. 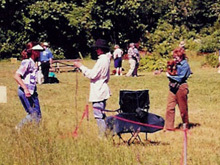 John and Diane had their first earthdog judging experiences as Introduction to Quarry judges, and had a wonderful time! 10-7-2001 (DCSAV/Sierra, Crossroads): Remy gets his second Master leg and Brandy her first Junior leg! 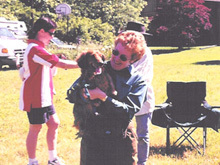 At the DCSAV earthdog tests on October 6-7 2001, Remy got his second Master Earthdog leg on the first day. On the second day, he only worked for 50 seconds and left the quarry. Remy needs two more legs for his title. Maybe Brandy is a hunter rather than a lover after all! She passed her Junior Earthdog test on 10/7/01 with flying colors! She needs one more pass for her Junior Earthdog title. 1-21-2001: Brandy passes Introduction to Quarry! Remy gets his first Master leg! 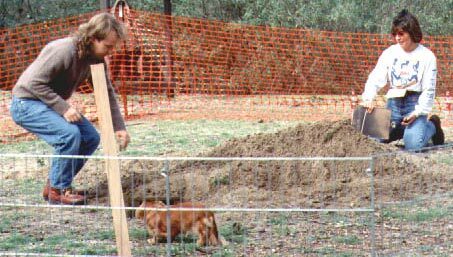 Brandy finally started showing interest in rats at some practice sessions, so we entered her in the Introduction to Quarry test at the DCSAV test in Corona on Sunday, January 21, 2001. Brandy had a perfect run -- she ran straight to the hole, reached the Quarry in 6 seconds, started working immediately, and worked vigorously for over 60 seconds. She was the only dog to pass Introduction to Quarry on Sunday! Is there hope for a Junior Earthdog title for Brandy?? On Saturday, Remy ran in his first Master Earthdog test. He did well in some parts of the test, but failed others. On Sunday -- with some experience under his belt (and his handler's!) -- Remy had an excellent run and received his first Master Earthdog leg. He did well in the hunt to the den, marked strongly, reached the quarry in 25 seconds, worked the full 90 seconds, and honored properly. Master Earthdog is more complicated than the previous earthdog tests, and more fun for both dog and handler! Remy wins his Senior Earthdog title! It took nine tries, but Remy won his Senior Earthdog title on 18 November 2000 after three successful tests in seven days! The final test was a nail-biter -- after recalling in 12 seconds on Sunday and 15 seconds on Monday, it took 54 seconds to recall Remy on Saturday. But he came out in the allowed time, and won his title! The Senior Earthdog test is quite a bit more difficult than the Junior Earthdog test. The tunnel is more complicated, with the addition of a false den and a false exit. The dog must reach the quarry in 90 seconds and then work (bark, dig, scratch) the rats for 90 seconds (a long time when you're the anxious handler). Once the dog has worked for 90 seconds, the rats are removed from the tunnel, and the handler must call the dog out of the tunnel and get control of him within 90 seconds (the "recall".) Sometimes the dog just doesn't come out, and the handler calls in vain for a minute and a half (it seems like an hour.) Or, the dog could pop out (at either the entrance or false exit), and then go right back into the tunnel before the handler can grab him. 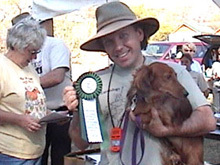 To win the Senior Earthdog title, the dog must pass all elements of the test in three separate tests under two different judges. Each pass is referred to as a "leg" towards the title. 1/22/00 (DCSAV, Anaheim): Remy didn't work at all, just stared at the rats. 1/23/00 (DCSAV, Anaheim): Another staring performance. 6/4/00 (NJBEC, Crosswicks, NJ): Remy had difficulty finding the entrance in the tall wet grass. Once in the tunnel, he found and "worked" (barked) in the false den. He then found and worked the real quarry for 40+ seconds (not long enough), but recalled in 40 seconds. Not a pass, but encouraging. 6/26/00 (GWTA, Anaheim): 20 seconds to reach the quarry (good); 2 seconds to start working (good); worked for 48 seconds (not long enough); recall in 11 seconds (very good). A good performance, but No Pass. 9/23/00 (DCSAV, Anaheim): in and out of the tunnel; finally reached the quarry, but didn't work until encouraged. Never left the rats during the recall. Failed every part of the test. 9/24/00 (Sierra, Anaheim): 60+ seconds to the quarry (okay); worked the full 90 seconds; but never left the rats during the recall. Passed everything but the recall. 11/12/00 (DCSAV, Anaheim): 19 seconds to the quarry; worked for the full 90 seconds; recalled in 12 seconds. A perfect performance, and Remy's first SE leg! 11/13/00 (DCA, Anaheim): 17 seconds to the quarry; starting working in 3 seconds and worked the full 90 seconds; recalled in 15 seconds. Another excellent performance, and Remy's second SE leg! 11/18/00 (GWTA, Anaheim): 26 seconds to the quarry; worked the full 90 seconds; recalled in 54 seconds (whew! ): A bit nerve-wracking, but a solid pass and Remy's Senior Earthdog title!! A note of thanks: Unlike the Junior Earthdog test, passing the Senior Earthdog test requires quite a bit of practice for the dog to do well. Remy would never have earned his SE title without the excellent training techniques and facilities provided by Margaret Hummen and the encouragement and help of Carol Hamilton. Thank you! Diane congratulates Remy on his excellent recall following his Crosswicks SE test. You can tell that Remy had a great time! Remy wins his Junior Earthdog title! 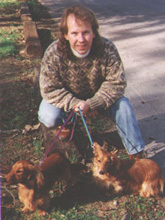 Remy passed two of his first three Junior Earthdog tests, and qualified for his JE title in October 1999. The Junior Earthdog test involves a tunnel which is 30 ft long, with three 90 degree turns. To pass, a dog must navigate the tunnel and reach the rat within 30 seconds, begin working within 30 seconds, and work uninterrupted for 60 seconds. 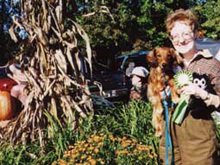 A dog must pass the test twice under different judges to get his Junior Earthdog title. Remy qualified for his JE title at the West Highland White Terrier Club of America test in Crosswicks NJ on 11 October 1999 (he accompanied us on a business trip to NJ.) Remy passed, under judge Nancy Sankus, and qualified for his Junior Earthdog title. 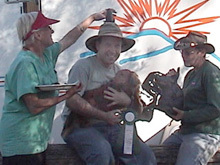 Remy with his handler and prizes. 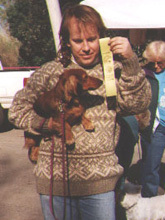 Remy passes his first Junior Earthdog test: Remy entered Junior Earthdog for the first time at the Dachshund Club of Santa Ana Valley earthdog tests (see below) in Anaheim CA on 25-26 September 1999. On Saturday, he ran the tunnel in under 10 seconds, but stared down the rat instead of working. On Sunday, under judge Carol Hamilton, he passed all three elements of the test -- reaching the rat in 8 seconds, beginning work immediately, and working the rat for over a minute. 1. John releases Remy on the scent line. 2. Remy heads for the tunnel at top speed. 3. A second later, Remy is entering the tunnel. 4. At the end of the test, John removes Remy from the tunnel. Remy is still fixated on the rats, which are in a cage just in front of the opening. 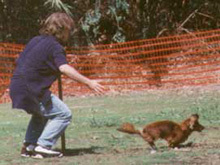 Remy passes Introduction to Quarry: Both Brandy and Remy participated in the Introduction to Quarry test on February 7, 1999. It was Brandy's third test, and Remy's second. Brandy did a great job running the tunnel, but (once again) didn't work the rat. Remy was a little hesitant about going into the tunnel, but got through in plenty of time and was very enthusiastic about lunging and barking at the rat. He passed! Remy and Brandy get ready for the Introduction to Quarry test. Remy and John admire Remy's qualifying ribbon. 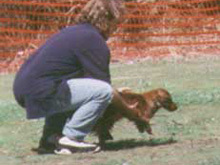 On 8 February 1998, Brandy entered her first earthdog test, hosted by The Dachshund Club of Santa Ana Valley. "Introduction to Quarry" was Brandy's first exposure to the earthdog experience. She didn't pass, but did well for her first attempt. Below, Brandy is not sure she wants to go into the dark tunnel. But she did go in, made it all the way to the end, and barked and sniffed at the rat.